On Monday we saw Tefel and Adonminus advance from Group C in a set of great games. Tonight we will see which two players will be the next to join them in the RO8! Satiini is going to be tonight's player who everybody knows and should be feeling fairly confident of coming out of this group in at least second place. He is well known for being a strong player in online cups and we saw why when he qualified into the RO16 when he beat Adonminus and TrOn - two players who we know are very good - in the Season 2 Finals. Recently we haven't heard quite so much of Satiini, but his level of play should definitely be enough to make him one of the favourites to come out of tonight's group. Expect standard and straight up play from him as he will look to simply outshine his opponents mechanically. Tonight may end up as a bit of a Terran sweep as we have WCS EU Premier League RO32 player Noname as the second Terran in this group. Another player who plays in a lot of weekly and online cups and somebody who very few people know about. His recent performance (getting to WCS RO32) will put him as a favourite for this group next to Satiini and first place in the group will most likely come down to a BO3 in the Winner's Match between these two players. Noname played some great games against MVP and despite losing the series he was definitely able to get into very good positions, but a mixture of nerves and possibly inexperience cost him his advantage. These nerves shouldn't be an issue for him here, a much lower-key event which he should be expecting to make the RO8 of very easily. JackO is the first of tonights under-dogs. He is a Protoss player from Luxembourg putting in a lot of time to practicing while studying at University. He is one of these players who nobody will deny is good, but is he good enough? He made it here through a lot of consistency in Qualifier's where he made it to the RO16 and RO8 frequently - but he was never really able to go any further and the list of players he took out on his way is by no means weak, but it isn't like he was causing upsets left right and centre either. 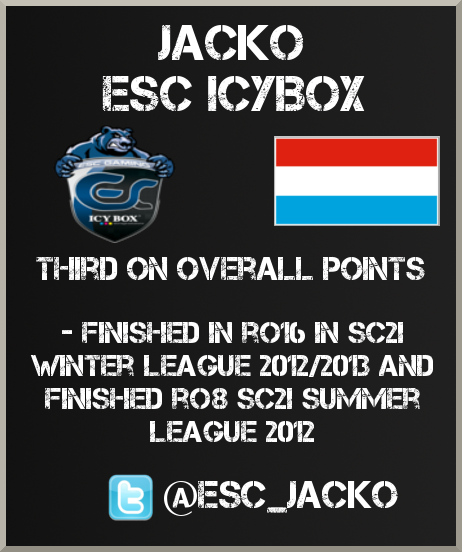 Having joined ESC just yesterday after his previous team CPLAY merged JackO will be looking to take a series wherever possible. Maybe he can use the PvT 'imbalance' to show us a surprise against Noname, if not then expect him to probably be battling it with out underdog in the loser's match to finish 9th-12th, compared to his SC2Improve Winter League 2012/2013 finish of 13-16th after going 0-4 in his RO16 Group. And who is this other underdog? 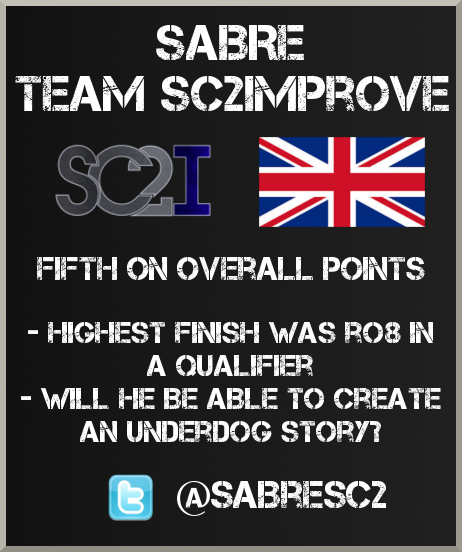 Well that would be Sabre from Team SC2Improve. Out of all the people from my own team who I thought might be able to qualify when the Summer League started I definitely did not expect Sabre to be the one person who would be able to make it and represent us in our own tournament. But over time he has definitely grown a lot stronger as a player and very similarly to JackO consistently has good runs through the Qualifiers. This being said he is a player who hits RO16 in the Qualifier every time and then just loses, and he qualified with almost halfthe qualification points of JackO. It's going to be interesting and if things go as expected I expect Sabre and JackO to be fighting for that third place in the group in the Loser's Match - for dignity if nothing else.